Pigeons in Southwest Florida may cause problems because they travel in flocks, and they can create a large mess. If you own a business, flocks of pigeons can inhabit the areas outside of your building, leaving droppings on cars and entrances to your organization. In homes and businesses they can nest in attics and crawl spaces, leaving behind a mess to clean up in addition to odor and destruction of property. Infestations require expert attention because they’re one of the most difficult pests to remove. They’re usually accustomed to humans, so scaring them away isn’t as effective as with other bird species. 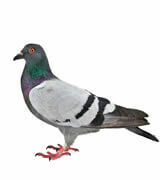 Critter Control in Southwest Florida is a pigeon control service you can trust in.